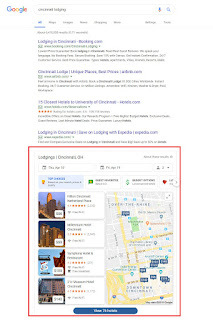 If you’re located within any decent vicinity of a major city or tourist attraction, you’re likely experiencing this: you do a Google search for “XYZ lodging” and every link on Page 1 is for an association, an OTA, or a directory. So what’s a small business owner to do? How do I get real estate on Page 1 in a saturated market? Also called the Map Pack, this feature specifically highlights local businesses with a brick-and-mortar location. Something that an OTA can't do. This means that you can find real estate on Page 1 even in tough markets. What do I need to do in order to show up in the Local Pack? Your Local Citations need to be completely accurate and in sync. A Local Citation is any mention of your NAP Information - meaning, your business's Name, Address, Phone. This fundamental contact information needs to be accurate, across the internet. Each of these mentions is considered a Local Citation. What are some common Local Citations errors? Your business's Address and Phone will rarely change. But we often find that business's names can have lots of inconsistencies. Let's assume that the official business name is "BnBwebsites Bed & Breakfast". These may seem like small variations but each of these inconsistencies hurts your Local Citations profile. How do I fix my Local Citations? The Long Way: Use Google's help to scour the internet, find your Local Citations, and correct them. You'll need to either log into your account and make the change or many of these directories allow you to Suggest An Edit. The Short Way: Use a lookup tool like Moz Local to find your most prominent Local Citations for you. These tools should also specify what the error is and provide a link for you to access the inconsistent Citation quickly. The Paid Way: Tools like Moz Local usually also offer a paid package so that you can input your correct Local Citation once and the service will handle the rest. What else do my Local Citations need in addition to NAP Information? What else can I do to compete with the OTAs and hotel chains? Local Citations are not the end-all solution, of course. As with anything web- or SEO-related, it's just one piece of the puzzle. You already know the importance of guest reviews. But you may not know that having a 5-star rating is just one piece of the reviews puzzle. Diversity: You don't want to have 300 reviews on TripAdvisor but only 5 on Google and only 10 on Facebook. Recency: After about 90 days, reviews start to depreciate in value. Quantity: If you only have 3 total reviews, that overall 5-star rating looks a little suspicious. The OTAs and chains might have inherently higher Domain Authority, exponentially larger backlink profiles, and thousands - or even millions - of dollars to spend on marketing. But that doesn't mean small businesses are simply out of luck. It means that you'll need to target and optimize differently.